Abstract. Beam tracing can be used for solving global illumination problems. It is an efficient algorithm, and performs very well when implemented on the GPU. This allows us to apply the algorithm in a novel way to the problem of radio wave propagation. The simulation of radio waves is conceptually analogous to the problem of light transport. However, their wavelengths are of proportions similar to that of the environment. At such frequencies, waves that bend around corners due to diffraction are becoming an important propagation effect. In this paper we present a method which integrates diffraction, on top of the usual effects related to global illumination like reflection, into our beam tracing algorithm. We use a custom, parallel rasterization pipeline for creation and evaluation of the beams. Our algorithm can provide a detailed description of complex radio channel characteristics like propagation losses and the spread of arriving signals over time (delay spread). Those are essential for the planning of communication systems required by mobile network operators. For validation, we compare our simulation results with measurements from a real world network. 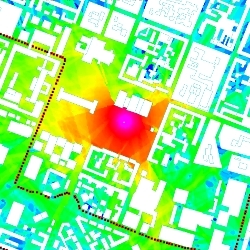 The left image shows the simulation result and markers of the measurement route that was taken. 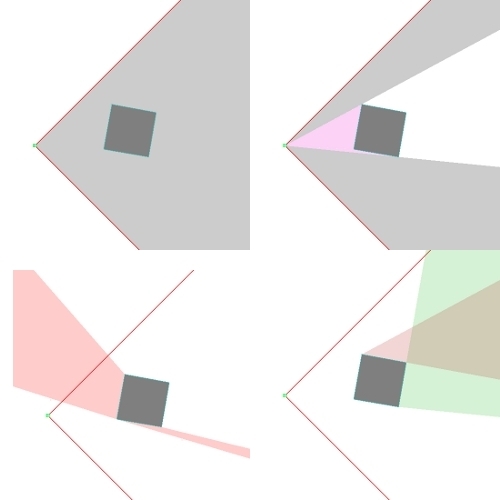 The images on the right illustrate the beam splitting procedure: (1) A beam is created and intersected with the geometry. (2) The beam is split into child-beams. (3) The old beam origin is reflected at reflection edges, constructing reflected beams. (4) Diffraction beams are generated at silhouette edges.